Objective: To monitor the presence of pharmaceutical residues of 14 psychoactive drugs belonging to three therapeutic groups in the watersheds of Galicia (Spain). Method: Five sewage treatment plants were selected in the main cities of Galicia. Thirteen psychoactive pharmaceutical compounds and one metabolite were chosen. In addition, tap water samples were taken from public places and private residences in the selected cities. Results: In all the water samples analyzed, the highest concentrations corresponded to the group of anxiolytics. In particular, high concentrations of lorazepam were found in river and tap water samples. Conclusions: This investigation demonstrates the presence of psychoactive pharmaceuticals in the watersheds of the autonomous region of Galicia and the conversion of metabolites to parent compounds. This work also shows the need to increase environmental monitoring of watersheds and to improve sewage and drinking water treatment processes to remove these pharmaceuticals. Key words: Antidepressants. Anxiolytics. Antiepileptics. Water pollution. Tap water. Spain. Objetivo: Monitorizar la presencia de 14 fármacos psicoactivos pertenecientes a tres grupos terapéuticos en la cuenca de Galicia. Método: Se seleccionaron cinco estaciones depuradoras de aguas residuales en las principales ciudades de Galicia. Se escogieron trece compuestos farmacéuticos psicoactivos y un metabolito. Asimismo, se tomaron muestras de aguas del grifo de espacios públicos y privados en las ciudades seleccionadas. Resultados: En todas las muestras de agua analizadas, las mayores concentraciones han correspondido al grupo de los ansiolíticos, y especialmente el lorazepam ha aparecido en altas concentraciones en las muestras de aguas de río y del grifo. Conclusiones: Esta investigación demuestra la presencia de fármacos psicoactivos en las cuencas de Galicia y la reversión de los metabolitos a sus compuestos parentales. Asimismo, muestra la necesidad de incrementar la monitorización ambiental de las cuencas y de mejorar los procesos de tratamiento de las aguas residuales y potables para eliminar estos fármacos. Palabras clave: Antidepresivos. Ansiolíticos. Antiepilépticos. Contaminación del agua. Agua del grifo. España. Pharmaceuticals are used for many beneficial purposes in modern society, but commonly constitute pollutants when encountered in the environment1. Sometimes, these compounds are not managed properly and are discharged directly into drains, while at other times they are not completely metabolized by the human body and are excreted via urine and feces in sewage treatment plants (STPs). Pharmaceuticals are not completely removed in STPs and may end up in the environment. 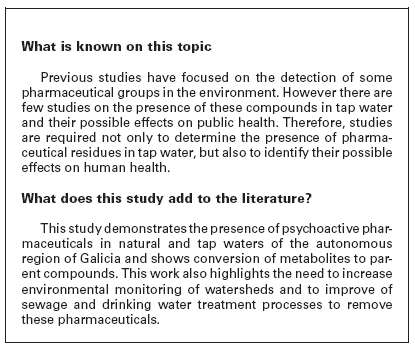 The aim of this study was to monitor the presence of 14 psychoactive pharmaceutical residues belonging to three therapeutic groups in Galicia's watersheds. The autonomous region of Galicia has a total area of 29,574.38 km2 and an estimated population of 2,796,089 inhabitants [5.98% of the population of Spain, database of the National Institute of Statistics (INEbase) 2009]. Five STPs were selected, one for each of the five main cities in Galicia: A Coruña, Ourense, Pontevedra, Santiago de Compostela and Vigo. For confidentiality reasons, the citation order of the cities does not reflect the numeration of the STPs (Table 1). STP1 and STP5 discharge into surface waters of the basins of Galicia-Coast and Miño-Sil respectively, and the remainder (STP2, STP3 and STP4) discharge directly into the sea. The sampling stations were carefully selected in order to produce consistent and representative results for the final interpretation of data. Pharmaceuticals were analyzed in the influent and effluent water from all STPs and also 50 meters downstream of the emission points of STP1 (DSSTP1) and STP5 (DSSTP5). Thirty-six grab samples were collected in three campaigns: August 2008, January 2009 and June 2009. One sample for each campaign was taken from each sample point. Seventy-five tap water samples were also taken from public places and private residences of the cities selected in the same campaigns as the wastewater and river water samples. Five samples for each campaign were taken in each city. Thirteen pharmaceuticals and one metabolite were chosen because of their potential toxicity and persistence in the environment. The pharmaceuticals analyzed are used as medications for the central nervous system and belong to three of the most frequently prescribed therapeutic groups: antidepressants, anxiolytics and antiepileptics. The method described in the literature and used by Gros et al.5 was chosen for sample extraction and instrumental analysis. Of the 14 psychoactive pharmaceuticals analyzed, 12 were detected in the wastewater samples of the STPs studied. However, in some STP samples the concentrations were below the limit of quantification. The percentage of samples and average values of detectable concentrations in the influent and effluent samples are shown in Table 2. Among 15 influent samples, venlafaxine was detected in 43%, with an average concentration of 401ng/L. Lorazepam was found in 87% of influent samples with concentrations of 10,598ng/L. Among 15 effluent samples, venlafaxine and lorazepam were detected in 67%. The average concentrations detected of venlafaxine and lorazepam were 317ng/L and 689ng/L, respectively. Most of the pharmaceuticals studied showed elevated concentrations in effluents and in some samples the concentrations found in the effluents were higher than those detected in the influents. The percentage of samples with detectable concentrations of DSSTP1 and DSSTP5 reached 50% for venlafaxine and lorazepam (Table 2). The average concentration of lorazepam was 168ng/L while that of venlafaxine was 67ng/L. Among 75 tap water samples, lorazepam was found in 3%, with an average concentration of 562ng/L (Table 2). Venlafaxine was found in 1% of samples at concentrations of 44ng/L. In all the water samples analyzed, the highest concentrations corresponded to the group of anxiolytics. In particular, lorazepam was found in high concentrations in the river and tap water samples. The presence of lorazepam in drinking and tap waters has not been studied in other works. The high concentrations detected in some tap water samples probably indicate that lorazepam is not eliminated by advanced drinking water treatments. In some cases, anxiolytics are subject to illicit use by the population because of their properties13 and are also common in veterinary treatments.10 Benzodiazepines are also used in stockbreeding, an important sector of the Galician economy, and therefore this source should also be considered. Several studies have shown that the likelihood of acute effects of such low pharmaceutical concentrations in drinking water is very low.7,9 However, little is known about the possible long-term effects of continuous exposure to low concentrations of these pharmaceuticals. Some authors suggest that although the consequences in healthy adults would be negligible, in the young or elderly these effects might be more pronounced due to reduced ability to remove toxic compounds from their bodies. In addition, in particular conditions such as allergies to certain compounds or vulnerable life stages such as pregnancy the possible effects could be more important.9,14,15 However, these affirmations do not constitute proof because there are insufficient studies in tap water exposure. The results obtained in this study are representative of the watersheds of the autonomous region of Galicia but may not be extrapolable to river and tap water from other areas. Another limitation are the point measurements. A continuous monitoring system would have been desirable to detect these compounds in higher concentrations. Finally, the design of this investigation did not allow assessment of potential risks to public health. To conclude, this study demonstrates the presence of psychoactive pharmaceuticals in the watersheds of the autonomous region of Galicia and shows conversion of metabolites to parent compounds. This work also highlights the need to increase environmental monitoring of watersheds and to improve sewage and drinking water treatment processes to remove these pharmaceuticals. This research was co-directed by Y. Valcárcel and M. Catalá and was performed by S. Esteban. The sampling design, sampling and analysis of the pharmaceuticals were performed by the Laboratory of Analysis and Environmental Quality (CIS) under the direction of M. González Castromil. All the authors contributed to drafting the manuscript and have approved the final document.